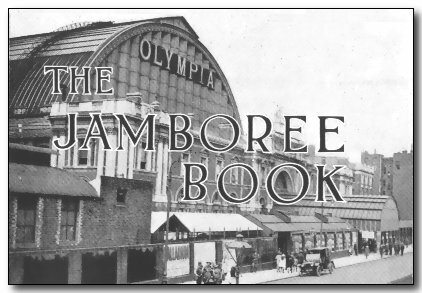 THE JAMBOREE BOOK was published by the Boy Scout Association to commemorate the successful completion of the 1st World Jamboree at Olympia, London in the summer of 1920. 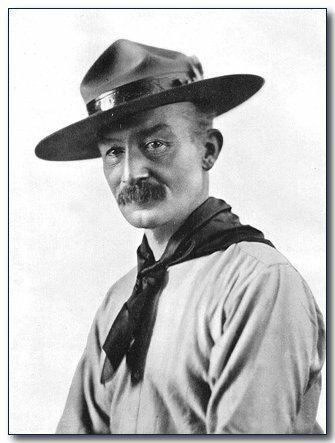 Held under the direction of the Council of the Boy Scouts Association and the personal leadership of the Chief Scout, Sir Robert Baden-Powell, the Jamboree marked an important landmark in the history of Scouting. The Jamboree hosted approximately 8,000 Scouts from 34 countries. Though the Scouts camped in a tent city in Richmond, the Jamboree itself was more of a Scout Fair and Convention, with exhibits, pageants and contests. It was held indoors, in the great hall at Olympia, a venue for major conventions and trade shows to this day. I HAVE been asked for a personal note on the Jamboree. I hate delivering myself of personal impressions. They are generally presumptuous, often out of perspective, sometimes they are sacred. My impression of the Jamboree may be something of all three. It was to me like watching a flower bursting into bloom from the bud; a miracle of Nature but none the less a miracle. A seed had been dropped but twelve short years back-war-broken years some of them-it had taken root and had grown into a sturdy wide-spreading plant. In that unique cosmopolitan gathering at Olympia in August, 1920, it blossomed forth and gave promise of fruits yet to follow. The secret of its growth lies in that indeterminate force which we only know as the "Scout spirit." It was the call to me while yet the movement was a seedling to leave what I was doing to come and tend it; it is the call which has brought men of all countries to work their souls out in cultivating it for one thing only-their younger brother, the boy. The voluntary team work of those men made the success of the Jamboree as it has made the success of our movement. But the Jamboree, carefully planned though it had been, had not foreshadowed the development of international brotherhood on a basis already so strong and so advanced as it proved, nor had it reckoned on so varied an expression of that wonderful Scout spirit, an exhibition that took onlookers by the throat as they had never been taken before. The rollicking swarming of joyous Wolf Cubs, rank after rank of clean budding manhood of all nations, advancing under the one banner, the boyish reverence on that never-to-be-forgotten Sunday service, and the culmination in that extraordinarily moving scene, the spontaneous outburst of goodwill on the last evening of all-the spirit that vibrated through the whole was perceptible to the most stolid. To bring impressions into their proper perspective after the shock of such revelation requires time and reflection, but there cannot have been one among us tinder that great dome who did not feel that here in these times of anxiety and doubt was unfolded a prospect full of promise and hope, where men and future men of all nations were gathered as brothers in mutual happy comradeship under a common ideal for the weal of the world. Our hopes and aims were more than realised. Success came on an unexpected scale. Critics were kind and the public sympathetic. The way in which Scoutmasters behind the scenes and boys in the Arena played the game for their side was an extraordinary experience. This undoubted observance by all of the laws of the Scouts, culminating in this evident bond of brotherhood, has given one to hope that the final promise, made on the night of our parting, may have a dominant effect in the future when every boy of the 10,000 present asserted his determination by the help of God to endeavour to take his share in developing peace and happiness in the world and good-will among men. Cartoon by "Matt" from the "Daily Sketch." WHAT was the origin of the Jamboree? Many people have asked this question. 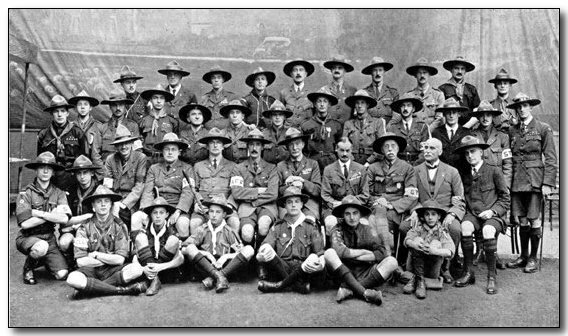 The proposal to hold a great festival that would at the same time be a fitting celebration of the Tenth Anniversary of the Boy Scout Movement and a Peace Thanksgiving on the termination of the Great War was first mooted as far back as 1916 when the Chief Scout evolved the idea and submitted it to the Council at General Headquarters for consideration. The scheme caught on at once and immediate steps were taken to put into concrete form the views already expressed. On July 26th, 1916, the first Committee Meeting was held at which it was decided, inter alia, "That an Imperial and International jamboree shall be held in 1918 provided the war is over in 1917." Although the pious hope expressed in the latter paragraph did not materialise, this did not deter an untiring band of workers from persevering in their self-imposed task, with the results we all know. This briefly, then, was the genesis of the Jamboree. One of the earliest things that had to be decided, of course, was where to hold the jamboree, and this in itself was no easy task. First, it was realised that the site would have to be a most commodious one if the vast assemblage anticipated was to see anything of the Show. Next, it had to be under cover in case of bad weather. Again, it must be accessible to the public and give a good view from all seats in perfect comfort-and few such buildings exist. Among the likely places considered were the Crystal Palace; the Agricultural Hall; White City Central Building, Westminster; the Albert Hall; the Duke of York’s School and Chelsea Gardens, but all fell short in some degree of the standard set up by the Directors. Finally Olympia was decided upon and the building was ultimately secured upon most advantageous terms. Then the work commenced in very earnest. Committees were formed and re-formed, responsibilities divided and sub-divided until as far as was humanly possible every contingency had been foreseen and provided against. Every commissioner, every scoutmaster, every scout organisation in the world was invited to the jamboree, and about 30 countries accepted. Many could not accept for various reasons, chiefly, it should be said, on account of the difficulties of transport. All this time the work of organising the jamboree was proceeding apace. All was wonderment and conjecture. Such an undertaking had never before been attempted. No one knew how it would turn out. The original Programme, still extant and dated "1916," outlines a Wolf-Cub Chorus Of 2,000 voices with a jungle Dance and Games. For the Scouts there was a Bridge-building Competition, a Trek-cart Race, Fire Fighting, Dealing with Accidents, Massed Chorus Whistling, Camp Work, and Badge Work. 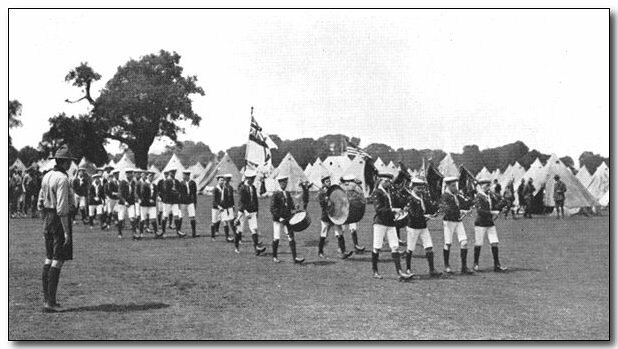 The Sea Scouts were to show Work Aloft, Derrick Rigging and Hoisting Cargo, the Patrol Leaders to deal with Courts of Honour and Conferences, and the Rovers to give displays in connection with the Fire Brigade and accidents of various kinds. In the main this original programme was adhered to. Meanwhile other departments were getting busily to work. Imperial headquarters resounded with the clatter of many typewriters, scouts staggered to the post offices with bags packed full of correspondence. Buckingham Palace Road was a very hive of industry. Nor was energy less keen in the provinces. It was obvious at the outset that all the contests of the many events could not take place in the arena at Olympia, so a great system of eliminating trials were inaugurated, and these took place in various parts of the country in the guise of local Jamborees. Liverpool, Manchester, Birmingham, Maidstone, Norwich, Oxford, Cambridge, Belfast, Dublin, Swansea, Plymouth and a host of other places all held Jamborees of their own, and the pick of the teams and the winners of the chief events were selected to come to Olympia. By this time the advertising department was getting busy and thousands upon thousands of sheets of descriptive matter were literally showered upon the public. The printing orders included 15,000 handbills, 70,000 circulars, 40,000 leaflets, 1,500,000 advertising stamps, 1,000 24-sheet posters, 5,000 double-crown posters, 5,000 double-royal posters, 5,000 hanging cards, to say nothing of the advertisements in the newspapers. Besides this, the Chief Scout sent 10,000 letters to Scoutmasters and 20,000 copies of a "Special Headquarters’ Gazette " were published. On the top of this there were many hundreds of columns of Press notices and newspaper illustrations keeping the movement and the jamboree well before the public. "Some of the Men Behind the Scenes"
P. Armytage, Esq., M.V.O., Col. E. A. P. Hobday, C.M.G., A. Poyser, Esq. THE next important piece of work to be considered was the preparation of Olympia for the great Pageant of Boy hood that was eventually to occupy the arena. This was intensely interesting, for Olympia is one of the most wonderful buildings in the world. In the first place it has the largest single span roof in existence anywhere. Not even the Crystal Palace with its acres of glass can compare with the remarkable building in the Addison Road. The arena proper measures some 325 feet by 85 feet-beyond this on either side and at the ends there is still room for the seating accommodation and the broad avenues, one of which was known as Mafeking Street during the jamboree. Then in addition there is the Annexe which proved so interesting during the run of the Show. All around Olympia are the outbuildings, stables, lifts, mess-rooms, bath-rooms, kitchens, stores and tons of plant and impedimenta used at different shows, while underneath are cellars that rival to an extent the Catacombs of Ancient Rome. Six days before the jamboree started Olympia was in the hands of the authorities of the Aero Show, but working night and day the building was ready by July 30th for the Dress Rehearsal. Olympia on July 26th was an empty shell,but at the stroke of midnight the building passed into the possession of the Council of the Boy Scouts Association and work commenced at once. At the stroke of midnight the scene was magical. Three hundred brawny workmen suddenly sprang as from nowhere and the iron seating began to pop up through holes that had mysteriously appeared in the concrete floor. Wire ropes descended from ceilings that could scarcely be discerned in the semi-darkness notwithstanding the millions of candle-power that the electric generating plant was feverishly supplying to the hundreds of lamps in and about the building. One end of a rope would be attached to an electric hoist, the other would disappear through a hole in the floor, only to emerge a moment later with a segment of iron stanchion that, built up tier upon tier, was destined ultimately to support the seats. Bit by bit four hundred tons of ironwork were in this way brought to the surface and run off to the places where engineers were in waiting to bolt the seating together. It was not very long before six thousand seats had been placed in position, and needless to say the work was so well done that the inspectors of the London County Council, who are ever present in the interest of the public who are ultimately to use the seats, could not discover anything to find fault with and the structures were immediately passed. All this time workmen on the other side of the Arena were getting busy with the set piece, the forest scene with the ship at anchor in the bay that all will remember so well. This scene was designed by Mr. R. G. Heaton, Managing Director of Olympia and also a Managing Director of the jamboree. How much it weighed in its entirety can only be imagined, but that it was most strongly built is evidenced by the fact that the Pageant of Nations and many other "turns" came down the defile into the arena at every performance for a whole week without the slightest mishap. Then there were the five magnificent trees of the forest, each over 100 feet high. They "grew" in Olympia in half an hour-the most speedy intensive culture on record. In front of all was to hang the great green curtain, the largest " cloth " in the world and constructed especially for the jamboree. This wonderful piece of work was 120 yards long by 50 feet high and contained no fewer than 6,000 square yards of material of a substantial thickness. It weighed nearly 1½ tons and was raised and lowered by electricity at every performance. The huge glass roof of Olympia was covered from within by 6,000 yards of muslin made to represent a blue sky. The work of placing this was very exciting, as it could only be fixed by men who had first to climb up the girder work on the inside of the domed roof before fastening the "Sky" into position. A slip of the foot would mean a fall into the arena 200 feet below, but old sailors are always selected for the job, and an accident of this kind is unknown in the history of the building. Their daring and disregard of danger is almost incredible. One old sailor who was missing from his work was found eventually asleep in the girders right up in the centre of the ceiling and close to the glass. Feeling tired and wanting to steal a brief nap he had shinned up the lattice-work and climbed out along the girders that support the roof like a fly crawling across a ceiling. Then he put himself to bed. But, alas, his hearty snores gave him away, and a colleague climbing up the metal groining soon had him back to earth. Mais, revenons à nos moutons. Not only had the ceiling to be covered but so had the walls as well. This was hidden by 90,700 feet of canvas beautifully painted by a small army of scenic artists who depicted most wonderful scenes of Oriental life, landscapes and seascapes with naval and military aeroplanes and airships in full flight. Nor was this all. The floor of Olympia is of concrete and it was necessary to cover it with 12 inches of earth, on the top of which was a layer of tan. Altogether about 2,000 tons of this was laid on the floor, raked and rolled until at last the surface was as firm as a cricket pitch, enabling races to be run and tents to be pegged as if in the open country. During the whole time the jamboree was in progress no fewer than 1,500 Boy Scouts slept at Olympia. This was necessary owing to the fact that the boys who appeared last in the arena at night would have found it difficult to get back to their camps and to bed. This necessitated the erection of 1,500 bunks in the gallery, but everything went without a hitch and the beds were ready as and when each troop arrived to take up its quarters. The messing, too, was a most important item, and an excellent system was arranged whereby about 2,000 Scouts were regularly and well fed each day and in a most expeditious manner. Baths, too, were very necessary, for every time a troop " made up " for a part there was dust and tan and grease paint to be removed in large quantities and only a hot bath in some cases would restore a particularly grubby Scout to some semblance of humanity. Photo by courtesy of "The Sphere"
A VERY important branch of any undertaking such as the jamboree is the Box Office. It is in this direction the promoters look for the proceeds which are in the main to liquidate or to assist in liquidating the costs of the venture. The Box Office commenced its work at a very early stage of the proceedings by mapping out the seating accommodation, deciding the prices, the number of blocks for each particular price and what seating should be retained for the use. of the Press, the staff and privileged visitors, etc. When all this had been accomplished there were the tickets to be printed, bound, delivered and checked. The tickets in hand, the libraries and ticket agencies had to be approached, for these might buy at a reduced rate whole blocks of seats in the manner of a speculation. The remainder were sold at what is known as the Advance Booking Office before the day or any time ‘previous to the actual performance the visitor desired to witness. Generally speaking the Box Office arrangements worked all right at the jamboree. At times there was slight congestion due largely to the anxiety of the public to make sure of getting to see the Show. The disposition was to view the performances in the afternoon, and this was the time when the public inconvenienced itself most. Many hundreds of people purchased tickets for the evening and used them in the afternoon oblivious of the fact that the seat had already been sold for that occasion. The result was that in quite a number of cases crowds surged along the gangways only to find someone in the seat. Once in the promenades, however, it was impossible to send them back. Still, the utmost good humour prevailed, and with a little tact the trouble was usually overcome, seats reserved and unsold being frequently given up so as not to disappoint the public. As a consequence of this, however, the house was jammed in the afternoons, while the evening visitors had plenty of room to themselves, whereas the Box Office showed that the seating should have been comfortably filled on each occasion. Many having paid their one and threepence (which admitted to the building only) thought they were entitled to see the performances, and no amount of explaining could make some such as these see the impossibility of providing a seat for one and threepence to witness a £20,000 Show. One irate old lady having paid her admission fee thought at least she had purchased a seat in the Royal Box. She demanded to see someone in authority. "What I want to know is—who’s in charge of this ‘ere jumble Sale ? " " Jamboree " was, indeed, a difficult word for many.